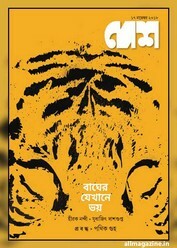 West Bengal's traditional literary base Bengali fortnightly magazine is "Desh". This well-known magazine is publishing from Kolkata city. Its readable copy is print out on 2 and 17th of every month by Anand Bazar Patrika Group. This old but all time update Bangla famous patrika is the best literary related magazine for Bangla talking people. Now I want to share a pdf file of Desh on 17 November 2018 edition. The cover story of this edition are- various know and unknown information about the tigers, an article about Upokhyaner Upokhyan, two stories about the cover page, three stories by Agradwip Dutta, Ritabrata Guha and Soumitra Chakrabarty, serial novel- Jonakider Bari by Smaranjit, poems, travelague, Suduku and many more topics. Dear readers can collect this fortnightly issue- '17 November 2018' in pdf.